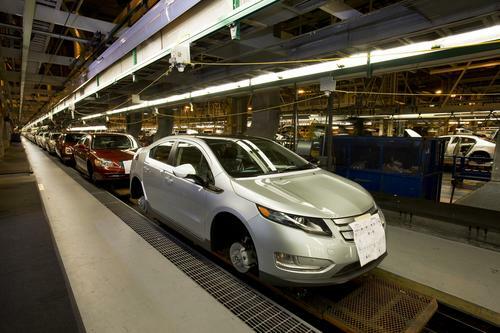 General Motors plans to shut down the Michigan plant that builds the Chevy Volt for four weeks from mid-September to mid-October. “We are continuing to match supply and demand of the Volt,” Randy Fox, a spokesman for the automaker, told us. “But at the same time, we are gearing up for production of the 2014 Chevy Impala” at the Detroit-Hamtramck plant. Fox said the Volt and the new Impala will share the same production line, which needs to be retooled. The shutdown will be the second for the Volt this year. The first occurred six months ago, after GM executives lowered their forecast (originally 45,000) for Volt sales for 2012. Lux projects that global annual sales of “heavy plug-ins,” such as the Volt, will reach 150,000 by 2020. By that time, sales of conventional hybrids, such as the Prius, will reach 2.7 million per year, and sales of “light plug-ins,” such as the Prius PHV, will be around 600,000. In the first seven months of this year, GM sold 10,666 Volts — an increase of more than 40 percent over the entire year of 2011, according to plugincars.com.